Every year we see the same trend. People love and enjoy the experience of shopping for Christmas, but have no time in their busy schedule. This is the main reason why Christmas shopping by private jet or air taxi has become very popular over the past few years. Every year we see a peak of private flights taking place the weeks before Christmas. Private flight passengers want to travel quickly to a large city famous for Christmas shopping for one or two days. They quickly buy their much needed Christmas gifts and return home afterwards. To make shopping easier we have compiled a top 3 of popular Christmas cities where you can do your Christmas shopping and at the same time spend quality time together with your loved ones. If you go to Paris at Christmas, you can enjoy the special Christmas atmosphere created in the city starting from the end of November. Particularly when night falls, Paris turns into a fairytale city where shops, churches, squares with thousands of lights form a special entourage. During Christmas time Paris will definitely leave a lasting impression. Perhaps the most visited tower in the world during Christmas. Even more than usual, the Eiffel Tower and its surroundings is a must to visit. As always the special illumination of the Eiffel Tower is lit at every hour and the lights flash like a huge Christmas tree. In Parc du Champ de Mars, next to the Eiffel Tower, a large Christmas market can be found. In addition to the many stands, there is an ice-skating rink. The market starts a few days before Christmas and lasts until the first week of January. Crossing the bridge over the Seine, you will enter Trocadero. Walk upstairs so you stand on the terrace at Trocadero. 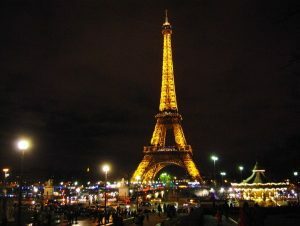 There you will find a phenomenal view of the beautifully illuminated Eiffel Tower, especially in the evening. Make sure you are there a few minutes before the hour to enjoy this free Christmas show! In the evening the painters which reside there throughout the day disappear from the Place du Tertre and the Christmas atmosphere prevails. The festive lighting and the illuminated Sacré Coeur provides an enchanting picture. If you go up the stairs to the Sacré-Coeur, you can first enjoy the beautifully lit basilica in the evening. For the ultimate Christmas feeling a visit to the Sacré Coeur is recommended. Not to be missed during Christmas is the Avenue des Champs-Élysées. 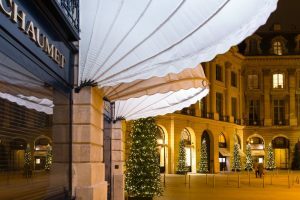 Every year, the prestigious shopping boulevard is illuminated and the trees next to the numerous shops, demonstrate a Christmas atmosphere which you can only experience if you walk the Avenue. Close to the Champs-Élysées you can find the most luxurious shops, jewelers and watchmaking shops. Throughout the holidays the shops are specially decorated for Christmas. Shops like Bvlgari, Rolex, Cartier, Jaeger Lecoultre, Chopard, Dior, Patek Philippe, Hublot, Chanel and many more can be found here. This is the ultimate place to buy your Christmas gifts. Check here if your favorite store is also present at le place Vendôme! 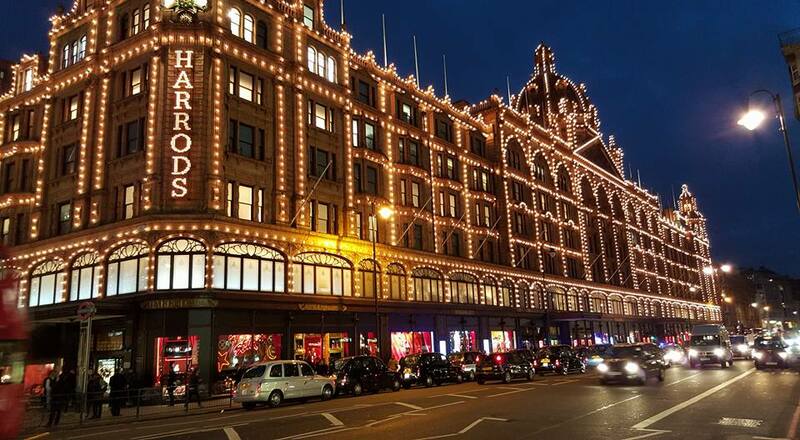 London, like Paris, is ideal for Christmas shopping by private jet or air taxi. The airport of Biggin Hill is close to the city center and connects you within 30 minutes with London city center. After arrival in London you will be able to feel the Christmas spirit immediately. All over the world this wonderful atmosphere is well known by people. Oxford Street is the best shopping area in London. It has 300 stores and during the Christmas period the shops are open from 09:30 till 21:00. Oxford Street is a true feast of lights and easy to explore by foot. If you are tired of shopping you can visit Hyde Park, there you can find Winter Wonderland, a nice fair combined with a food truck festival. Looking for a high end shopping experience? Large department stores such as Harrods and Harvey Nichols try to outdo each other in their Christmas decorations and lighting. Marvel yourself at the Christmas themed festive window displays. Looking for some Christmas shopping in London, check our air taxi flight calculator? At Christmas Berlin transforms into a fairytale city. All streets and squares are decorated with thousands of lights, not to mention the beautifully decorated Christmas trees. The shops and department stores are also decorated in the Christmas theme. 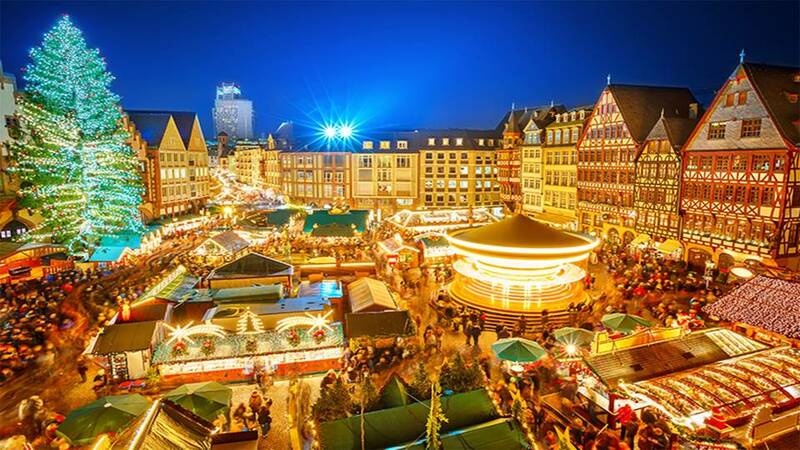 Famous in Germany, there are dozens of Christmas markets in Berlin. You will be overwhelmed with Christmas music, the smell of tasty food and Glühwein. Food makes a city trip more fun. In the tourist streets like Oranienburger Strasse, Sabignyplatz, Bergmanstrasse and around Kurfürstendamm you will find different types of restaurants decorated in the Christmas spirit. The Weihnachtszauber at the Gendarmenmarkt and the Berliner Weihnachtszeit are probably the most famous Christmas markets in Berlin. You can find the latter at the famous Alexanderplatz. You can ride the Ferris wheel if you would like to see the Christmas market from above. Are you more into sports? Have a ride on the largest ice-skating rink from Berlin. 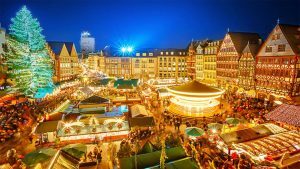 The Weihnachtsmarkt is located near the famous Kurfürstendamm shopping boulevard and close to the Gedachtniskirche. Looking for some other tips for places to visit in Berlin? Check our blog “Take an air taxi to the city of European contradictions: Berlin”. Due to many requests for private flights we are receiving in the weeks before Christmas, it is wise to book your Christmas shopping by private jet or air taxi well ahead! There is definitely no question: Christmas shopping by private jet or air taxi makes Christmas even more special. And it saves you time that you can spend on things that really matter! We would be delighted to help you, to get some additional quality time with your family. So for all your flight requests do not hesitate to contact us at info@flyaeolus.com or call us at +32 (0)3 500 9082 (Belgium), +31 (0)15 820 0999 (The Netherlands) or +49 (0)30 9789 6996 (Germany).